Looking for the most inconspicuous engine case protectors. Hey guys, I'm almost done with my bike, but having a hard time with some items, like case covers (wasn't thinking of getting any, but might be a good idea), and passenger peg blanking plates I need to use as tie-downs (started another thread on that). Also need ramps and stands, and will be done after that . Anyway, back to the subject. As some of you might know by now, I hate aftermarket parts emblazoned with contrasting logos. Furthermore, don't want our pretty engine cases obscured by ugly and bulky protectors. Unfortunately, every protector I've seen except one, involves BOTH detractions (Woodcraft, etc). I already installed frame, swingarm, and front axle sliders, precisely to avoid having to install engine cases. But somebody mentioned that depending on the fall, cases could still be damaged, rendering the bike useless. That left me thinking, and decided that if I find the right protectors, I'd buy them for added piece of mind. And that brings me to the 'except one' part above. I saw a bike with very narrow, nondescript case protectors, but my internet crashed, and never found it again. They were basically just a 'U', mounted with the bottom 4 bolts. Same thickness throughout the half-moon shape, with rounded edges at both ends. Very well integrated and stock looking, just like I want. Don't need or want heavy-a$$ protection with a full set of sliders already. Has anybody seen them? Or any other similar suggestions? I'd greatly appreciate any info you may have. To finish, a semi-related protection issue I have. My Shogun frame sliders are the 'interference' type, meaning they have a notch that faces the fairing, since they wouldn't fit otherwise (most are like that). Well, the left slider, for some reason, is very easy to rotate, even with the 51 ft/lbs of torque. A tolerance/quality issue, I suspect. But if left like that, it'd probably break the fairing in a fall, since it'd rotate, right? Thinking of removing it and adding a thin washer to add enough pressure to prevent easy rotation, like the right one. Comments welcome. Many thanks. it sounds like you're describing the rizoma guards. 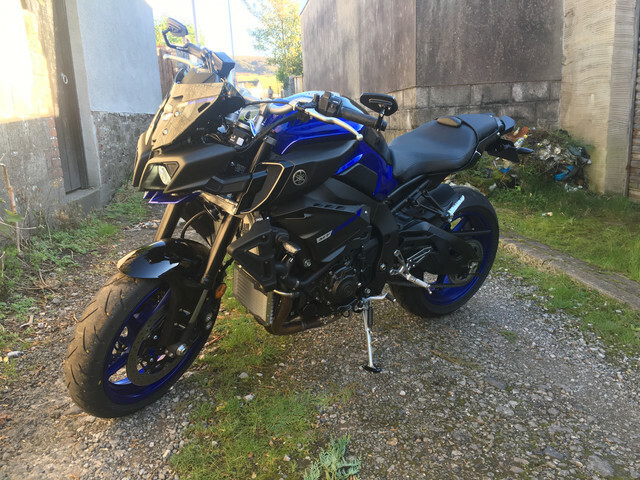 www.revzilla.com/parts/2018-yamaha-mt-10#page=1&sort=featured&limit=96&facets%5B%5D=1951&price=&price_min=1&price_max=2185&is_new=false&is_sale=false&is_made_in_usa=false&has_video=false&is_holiday=false&is_blemished=false revzilla has most sliders that I'm familiar with in their inventory system. I personally don't mind having an aftermarket logo on my aftermarket parts, but another option you have is to respray non-rizoma covers. my frame sliders also had some spin to them when torqued to spec. 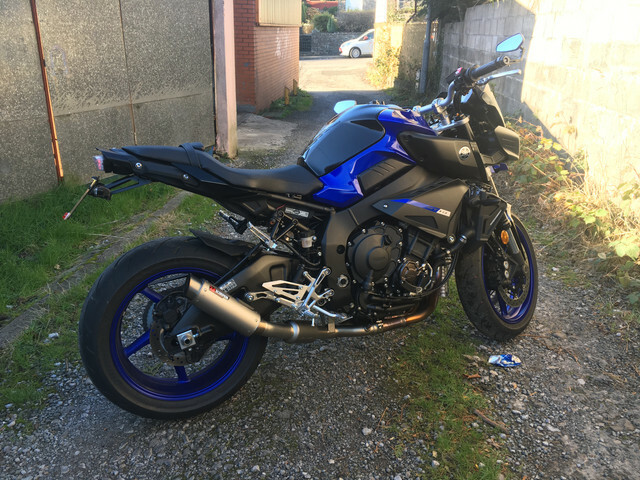 I told the shop about it when I was getting my bike dyno'd and the guy just torqued them down harder. I don't think a washer would hurt. Thanks a million brother. You know, looked under 'FZ10' on Revzilla and the Rizomas didn't show up at all. Now I find they even make clutch covers (Do we really need those? ), but they apparently don't offer a stator cover. Their ignition timing cover is not the one I saw, but it's actually nicer, and doesn't seem to have a large logo. It's on the expensive side, but at least now have a viable option. Thank you very much. The other I saw was slightly longer, covering one more bolt, by the way. Thanks again for your help. My R&G ones are a U shaped plastic appendage. Cost was around $45 per side. Not sure if this helps.